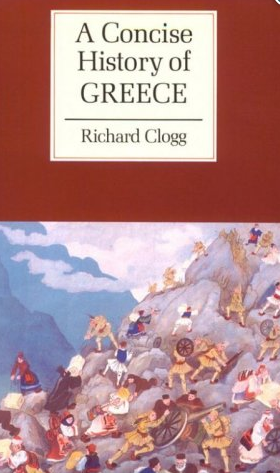 The book "A Concise History of GREECE" by Richard Clogg was first published in 1992, printed in Great Britain at the University Press, Cambridge. It has been reprinted many times since that date. I have included the Contents, List of Illustrations, Maps and the 156 Names mentioned in the book, transcribed below for your reference. If you are interested this book is available through the U.S. Inter-library loan program, you can work with your local library to obtain a copy. 5. Mikhail Soutsos, hospodar of Moldavia 1819-21. 9. The hanging by the Turks of the Ecumenical Patriarch Grigorios V in April 1821. 11. Nikitas the Turk-eater at the Battle of Dervenakia, August 1812. 45. King Paul and Queen Frederica visit Makronisos prison camp, 1947. 52. Stelios Papathemelis, Nikolaos Martis, Bishop Ezekiel of Melbourne and the Australian prime minister, bob Hawke, in Melbourne.